Get your free mini-course on how to find and nurture the healthiest, happiest, and best behaved Springer Spaniel around. Enter your first name and e-mail address in the form below, and check your inbox to confirm, then I'll email you your first lesson right away. Now on Amazon Kindle - Click Here! Springer spaniels are very active dogs, so lack of exercise is not good on two counts – firstly they need exercise, as all dogs do, to maintain a healthy body and good muscle; secondly, the springer will become very bored and unhappy without exercise, as is it is such a big part of their nature. The very young pup will not be up to much walking and running, so start off very gently in the first few months when the pup is still learning to walk steadily and gaining confidence – walking, running and playing in an enclosed space is enough – maybe the yard or your garden if the boundaries are secure. Once you are able to walk him gently on a lead you can gradually extend this distance ‘around the block’, judging when the pup is getting tired, and not overdoing it – you have to let them make the pace at this time when their bone are relatively soft. They need to get out into open space where they can be let off the lead – you can start this at about 4 months, but choose your area carefully. The pup will have a natural tendency to run and hunt. Let him roam and get used to the sound of your voice – not shouting; he will return to the security he knows; sometimes it might take a bit longer to return, but don’t scold him if it does. An old sock or glove can be used to get them running and fetching – it comes naturally to springers. This gives them plenty of exercise and lets their natural instincts come through. As the dog reaches 6 months old, then training will become more focused and formal, and besides regular walking, he will be getting exercise as part of the retrieve training. You do need to be satisfied that ‘recall’ is working well and that your dog returns obediently when called, before you move into wider areas and more freedom for your dog. Try to vary the area where you exercise your dog – they do get bored – but this is not always easy mid week in an urban family environment. Walks for a springer spaniel should be 30-45 minutes long, with a couple of longer walks each week. Ideally it will include wooded or brushland areas where he can have a hunt around. Midweek, the springer can now be retrieving a ball in the park – you can throw a ball further than an old sock. Springers love to jump – well, they are called ‘springers’ – and you can exercise this with the ball. Whilst using a ball is a good way of concentrating their exercise with short sprints, the springer is not a sprinting dog – they are bred for endurance either at a walk or gentle trot, so you too will need to put in the walking hours! They can be introduced to water now – a swim is good exercise for them, but obviously the first few swims should not be on an outgoing tide in an estuary, but in a relatively shallow enclosed area, or small stream, where they can get used to water safely, and have a splash about. Mine loved the mud at low tide in the local harbour, but you do need to be prepared to clean up! One more detail – when out in the country with your springer, then you should remember to observe the ‘country code’ – particularly keeping your springer under control near other animals and closing gates. 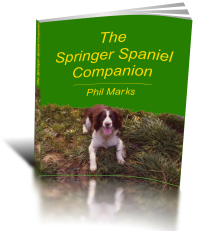 Next Next post: What are Springer Spaniels Rescue Dogs?